I was at Maverick earlier this year and I never saw a manual transmission. I went through the orientation and training, then went to a trainer for three weeks. I never even drove a Maverick truck until I was with the trainer, but I hadn't driven in a long time. You might not have to go with a trainer. I hope you live in an area where there is a dedicated route, which was not the case for me. Thanks for the kind words. Hopefully I will find something with more frequent home time. I have a question.. how much experience does Prime require to be considered an "experienced" driver. They have a dedicated account (tanker) that I maybe could get on, but I really don't want to go out with a trainer again if I don't have to. Yeah, I wish I could have done that. I'm happy for you that you found something that fits your needs and that you are happy doing. I live in southern Ohio, but I will check to see what their hiring area is. I totally agree with you, Old School. I should have asked for more help before I quit, and I should have given more updates as I went along. You are right - it was a mental thing. It wasn't the physical side (although that part WAS hard at times as well). When I first left for orientation, I was gone for about 7 weeks straight. I went through orientation, flatbed training and then glass training. (C.T., I was in the glass division). Then I went out with my trainer for 4 weeks. Next was final eval and I picked up my truck. Then I did finally get to go home for about a week. When I started driving solo it was all good at first. But as I continued it was getting harder to leave the house after my 3 weeks out. I started dreading having to leave knowing it would be a long three weeks until I made it home again. I could have stayed out for just two weeks, but the home time was not guaranteed then. I would get by the house, but maybe only for a 10 hour break. What I said before about the work being hard at times is also true. It is not the main reason that I quit, but as I think about it, it did contribute. It IS a lot of work securing and tarping the glass, and it took me a lot of time (5-6 HOURS on my first couple loads.) Everyone said I would get better and faster with time, which was probably true. But I am almost 50 years old and not in great shape, so it was pretty hard for me. Not unbearable, but hard work. I asked my fleet manager if I could switch to the TCD (referigerated) division, and he said I should stick it out in glass for a while and I would get used to it. I did for a while, but I asked him again, and he said it might take a few weeks to make it happen. So by this time I wasn't liking glass, AND I wasn't getting home enough. So a couple of weeks ago, I was doing a 34 hour reset at a Maverick terminal, and the whole time I was thinking "I could be home right now". So I rented a car and cleaned out my truck and went home. I called my fleet manager and told him and that was that. I regret making a hasty decision like that, and I am not usually that way. I don't know..it just got to me mentally and I was not happy when I was out. 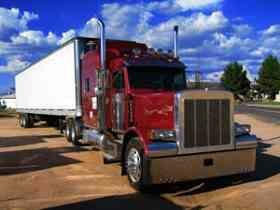 Trucking is a totally different lifestyle - at least OTR was for me. And I DID know this going in to it. I just thought I would get used to it. Yes, I could have waited to get into TCD, and the work would have been easier, but I would have still had to be out 2 -3 weeks at a time. And that, at least for me, is too much time away from my wife and family. So that is the story of why I quit. I should have asked for more help/advise on here along the way. If I do get another trucking job, I will be sure and not drop off the face of the earth again. Hopefully I can find something with weekly home time. Or maybe trucking just isn't the right thing for me. Thanks for reading, and have a GREAT day ! I just wanted to post an update. I left Maverick a couple weeks ago. I still think they are a great company, but I just couldn't handle being away from home for weeks at a time. I thought I would get used to it, but I was wrong, I guess. I wish they had a dedicated account where I live, but they don't. So now I am looking for something with at least some weekly home time. Yeah, glass seems to get less home time than the other two. They said today that the average is 1.1 34 hour reset at home per month for the glass division. Sorry I replied before I read the whole conversation. My post really isn't relevant at this point. Maybe it will help somebody else though lol. Congratulations on your choice, Peter B. Schneider just ended up not being the right fit for me, but it sounds like you are happy there. Thanks for sharing your experience. I'm sure it will help a lot of people. Just a quick update - I ultimately decided to go to Maverick. I am currently going through orientation, and I think I made a good choice. I have enjoyed the experience so far. I passed the DOT physical and agility tests today, which I was a little worried about. But it was not as hard as I had thought it might be. C.T., maybe I'll see you around if you get back through Little Rock. Thanks again, everyone, for all of your help. I really appreciate it. Congratulations Turtle!! I'm very happy for you, and glad you are doing well. If you do, definitely hit me up. I'll hook you up with my flatbed trainer. He's awesome, and has won trainer of the year a few times. Wait, that won't work because he & I will probably be out otr. But I can have him suggest another trainer. There are some losers out there that are only in it for the money. He'll get you a good one that actually teaches you. That would be great! I will let you know for sure when the time comes. Thank you, I really appreciate it. And thanks Buck_Wheat. Good luck to you as well. Hard to say if I'll be around then, but by all means hit me up when you get here. You're very welcome. I already have my CDL, so at least that part is taken care of already. :-) I just haven't driven a truck in a decade, so I have to through the training as a student. The Yes, I will probably get to see a lot of the Northeast. They also have a dedicated account out of Indiana & Ohio that I am looking into. I guess I'll cross that bridge when I get there. Maybe I could go out with a flatbed driver for PSD, that way I could see how what that is like. Who knows, I might like it better if I tried that route. I am reading your posts with great interest, as I am scheduled to start there on Jan 9th. Thank you for the info! It sounds like you are doing great. Is anyone in your class going to the tanker division? I hope not to have to wait too long to get a tanker trainer, but if that is the case so be it. Good luck with your continuing journey! Maybe I'll see you there. Thanks, Seadragon. I will check them out. Merry Christmas! The time it takes for 30k teaming depends on how hard the trainer runs. One trainer could have you running 6k mikes per week son in five weeks you are done. My trainer ran less miles as a team than I did solo. Serious in two weeks her friend and i did 12k miles. It took me and her a month for that! Keep in mind that even with all that training....I still was nervous going out on my own. I can't imagine only three weeks of training. Well I found out real fast that it shows in WY even on Easter and 4th of July lol. The bad thing about primes training is that lease and owner ops get to decide where they want to drive. Which means even if in training and you WANT to drive in the snow for experience....you might not. That is something to ask your trainer. I came in winter for winter training and my oo trainer only really drove us through two snow storms. That wasn't enough time for me. The GOOD thing about teaming in training..because the person is asleep...I drove better. Having someone watch your every move 24/7 drove me nuts and messed me up more. When I didn't feel.watched I could relax. Whatever you decide, I wish you luck. As long as you stick with a major carrier you can't go wrong for your training and experience. After that year if you have doubts about the company than shoo around. I planned on only staying my year then going local...but I got it so good with my FM I was like "WHY"? Lol. I'm saving so.much money by living on the truck I would be just as miserable driving local as I was with a non driving job. Thanks, Rainy..that gives me a lot to think about. I am leaning hard toward Prime, and chances are that's where I'll go. Have a safe and Merry Christmas! I'm sure I'll have a ton of questions as I progress through training and such, but I'll try no to pester you too much! Sorry for late reply. I don't believe we have a guarantee. I'm regional and average 2000 or more for now. It's slower now of course. I make 1k a week usually, I don't usually net that much since I am regional and have family insurance and all that. Hi C.T. Thanks for responding. I just looked and I saw that the guarantee is on the TCD job site, but not on the Flatbed. It kind of seems to me if they have to offer that as an incentive, then the miles probably are not there to consistently make that much per week. I will have the same insurance and things also. I completely struggled for months over which company to go with. Ultimately I went with Prime flatbed, and I begin Monday. I can't say one way or another what may me choose them. Just a gut feeling I guess. That and I got such good vibes from my recruiter during our talks. Also, Rainy was instrumental in my choice, as her threads and comments were just so positive, it made the decision much easier for me. All are good choices, as noted. You kind of answered your own question. You do have to decide what's best for YOU. Thanks, Turtle. Good luck with your training! I am leading toward Prime also, and a lot of it is because of what Rainy has written here in the forums.